Soooo, I want some opinions here. 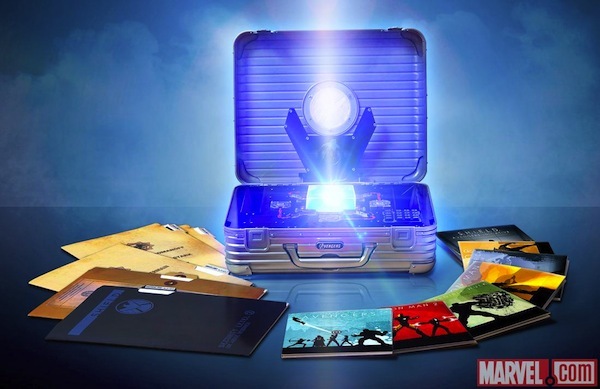 One of the geeky movie guys Max Foisey, on the talk show I listen to, was getting all excited about the [url=http://Marvel tesseract Box set]Marvel tesseract Box set[/url] he got. He got his at some comic book store @ $170. Said he didn't pay a dime because he traded things, but we all know about the truth behind that. I see on Amazon the set for $150. Do you think this would become a more valuable collectable over time. I was briefly thinking of getting it and never opening it. Maybe just tuck it away. It looks cool and if I came across it at half the price, I would probably snap it up. But it is definitely not worth the MSRP. I think you are seeing studios grasping at straws in what they can do to "revive" a dying format that is DVDs. Let me clarify, the format isn't DOA, but it has been losing money with eroding sales now that everyone is moving toward downloadable content and streaming. I think you are seeing studios grasping at straws in what they can do to "revive" a dying format that is DVDs. Let me clarify, the format isn't DOA, but it has been losing money with eroding sales now that everyone is moving toward downloadable content and streaming. Even more to maybe look at this as a collectable. 10 years down the road, will this be rare? I know no one knows what becomes a collectable.... just trying to look into a crystal ball. About as collectible as everything else they have released as a "collectible" in the past. Those same items nowadays, you couldn't even give them away. Isn't the Tesseract like the Hope Diamond of the Marvel Universe? You probably don't want that in your house. And where are you going to put it? "Have your Thanksgiving dinner off a porcelean copy of 'Freedom From Want.'" Are you crazy!!!! That will so lower the value. See, I'm not certain if you got the joke or not.